According to a research study performed by the University of Florida, a dollop of peanut butter may be used to confirm early stage Alzheimer’s disease. Jennifer Stamps, a graduate student in the UF McKnight Brain Institute Center for Smell and Taste, noticed something interesting while shadowing Dr. Kenneth Heilman, Professor of neurology and healthy physchology in the UF College of Medicine. Patients under Dr. Heilman’s care were not being tested for their sense of smell. After all, why should they be? Stamps wondered, though, if a correlation between lack of smell and Alzheimer’s disease could be found. Our ability to smell is associated with the first cranial nerve and is actually one of the first things to be affected in cognitive decline. Armed with this knowledge, Stamps suggested a study to Dr. Heilman. He agreed – but only if the test was quick and inexpensive. The test material Stamps came up with? Peanut butter. 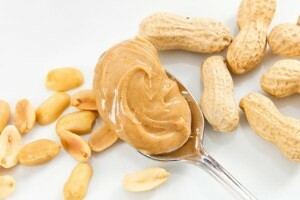 As a “pure odorant,” peanut butter is only detected by the olfactory nerve and is easy to access. In the study, patients who were visiting the neurology department for testing were asked to close their eyes and mouth, and block one nostril. The testing clinician would then open a jar of peanut butter, and using a ruler, move the jar one centimeter at a time closer to the patient until he could detect an odor. The distance was recorded and the procedure was repeated with the other nostril. Scientists discovered that patients in the early stages of Alzheimer’s had a dramatic difference in detecting odor between the right and left nostril. Currently this exciting discovery is only being used to confirm a diagnosis of Alzheimer’s, but researchers are hopeful that the peanut butter test will be able to predict who might be at risk of developing Alzheimer’s. Seventy percent of individuals with Alzheimer’s disease are cared for at home, according to the Alzheimer’s Association. Incorporating a reliable homecare system or homecare software such as ClearCare Online makes a challenging situation much easier for all persons involved. While many Alzheimer’s patients are cared for by their relatives, this can soon take an emotional toll. Countless families have found the best solution is to work with a reputable home care agency that offers ClearCare Online’s homecare system and homecare software for point-of-care transparency. The mind of an Alzheimer’s patient forgets basic care necessities like eating and bathing, so such responsibilities often falls on the shoulders of the family caregiver. A robust homecare system or homecare software like ClearCare Online outlines specific tasks and when they should be completed, eliminating bathroom accidents and skipped meals. Peanut butter may be the inventive new way to diagnose early Alzheimer’s, but a trustworthy homecare system has proven to be the best tool for managing patients with this disease.